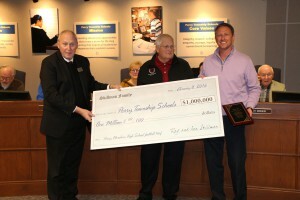 During Monday night’s Perry Township School Board meeting a representative from the Ray Skillman Auto Group presented the school district with a pledge of $1 million dollars to be used for the renovation of the football facilities at Perry Meridian High School. The gracious donation will be used to upgrade the current practice football field to an IHSAA approved turf field that can be used in all weather conditions for football, band practice, competitions and other school activities. This project is phase one of a two phase project that will turn the football field into a true “HOME” field for the Falcons after 45 years of playing their games away from the high school. 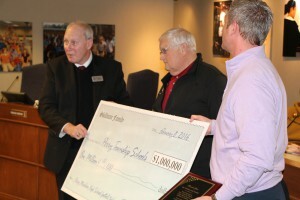 Perry Township Schools and the community are grateful to Mr. Skillman, his family and the company’s one thousand employees for their dedication to Perry Township and their willingness to invest in our children.